The Earth “Military Style” Camp Cot – Built Strong – Built Comfortable! A Camp Cot Built to Last. This folding camp cot is great for all types of outdoor use (and indoor use, too!). Great for campers, scouts, explorers, and even that unexpected house guest. 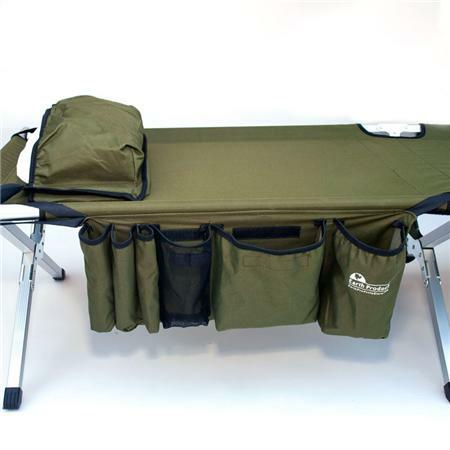 This high-end military cot is also ideal as an emergency cot and is currently used by many shelters. Portable, strong, and comfortable, this “longer” military cot comes in handy for even the tallest of sleepers. This specially-crafted army cot is extra long, so there’s no more worrying about your feet hanging off the edge. At 77” inches long, by 25” wide, there is plenty room. With a height of 17″, avoid the hard, cold ground – and wake up feeling more rested. Sleep soundly with the unique, body-contouring fabric. Easy set up and take down (in under 2 minutes), these folding camp cots make camping a snap and are great for any outdoor use – perfect as an emergency cot, military cot, cabin cot, or even that unexpected overnight guest at your home. After use, this portable cot folds up into an incredibly compact bag for easy storage until next time.